I am back from Christmas vacation, well actually I am still in holiday mode and celebrating again today with my side of the family. I couldn't stay away another day and wanted to check in with all of you. I hope everyone had a Merry Christmas and that you enjoyed/are enjoying your time with family and friends. We have been on the go, traveling here and there since Saturday. Even though the last few days have seemed to run together, I have made a conscious effort to take it all in and savor every single moment. I really don't enjoy the days leading up to Christmas, but once all the shopping, decorating and preparing are complete, that's when I stop and say, "ahhhhh, now this is Christmas". Singing Christmas carols, relaxing with our families, staying in my PJs until noon, candlelight church service, annual Christmas Eve at our friends' house, dancing in the kitchen with Ross to Michael Buble's "Have Yourself a Merry Little Christmas" after the kids were tucked in, my girls waking up at 4:00 AM to see what Santa brought, the living room looking like a hurricane blew through after all the gifts were opened, singing Happy Birthday to Jesus and so many more annual traditions that we have established as a family. So, I guess all the weeks of crazy madness that lead up to a few days worth of Christmas festivities is 100% worth it. Except the holiday hangover that proceeds and I am not talking about an alcohol induced one. Side note: I wore this outfit last week when we were back home for Christmas round one. We grew up in this town for 18 years, but for some reason I didn't remember this church, where we took pictures, existing. Ross didn't seem to recall it either. After we stopped for a few photos, we took a little tour of our hometown to reminisce and take a walk drive down memory lane. Even though I could never see myself living there again, it's always refreshing to go back and remind myself of where I came from and the history that it encompasses, our history. Thanks for stopping by on the day after Christmas, one of the biggest shopping/return days of the year. You guys are the best and I hope all of you have the day off to relax and recuperate. Festive but not over the top! I enjoy the black and brown combo, I really need boots like those. Merry Christmas! Love this look! Especially the boots. Love this!! 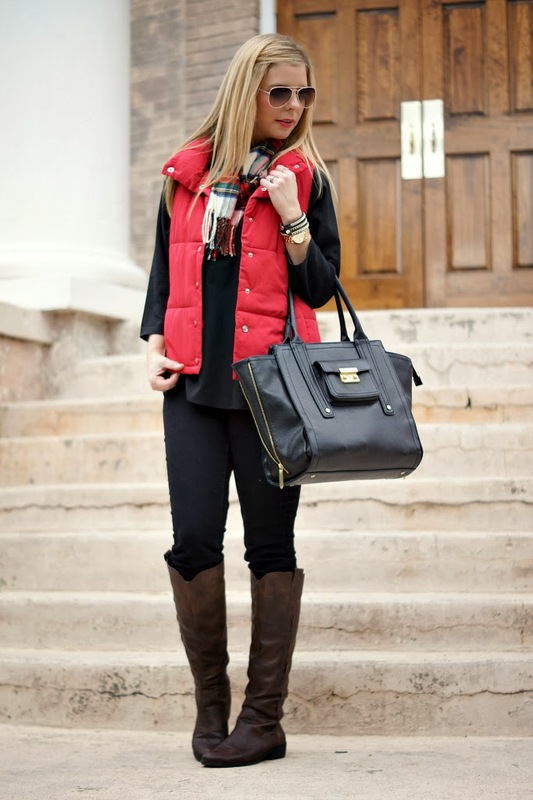 I think I need a bright, pop color vest now! I hope you and the family had a wonderful Christmas! I absolutely love this outfit and hope you had a great Christmas! 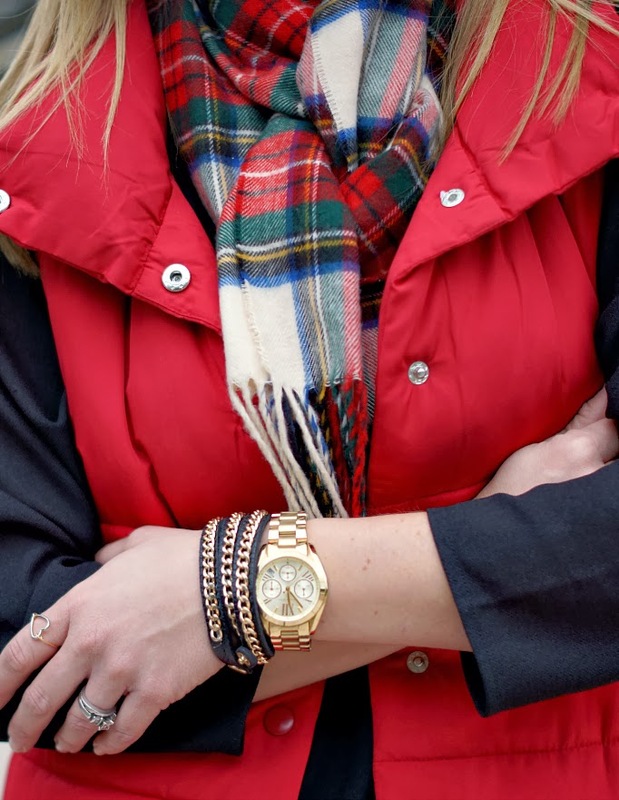 I can't explain enough how much I love this scarf and vest together!! 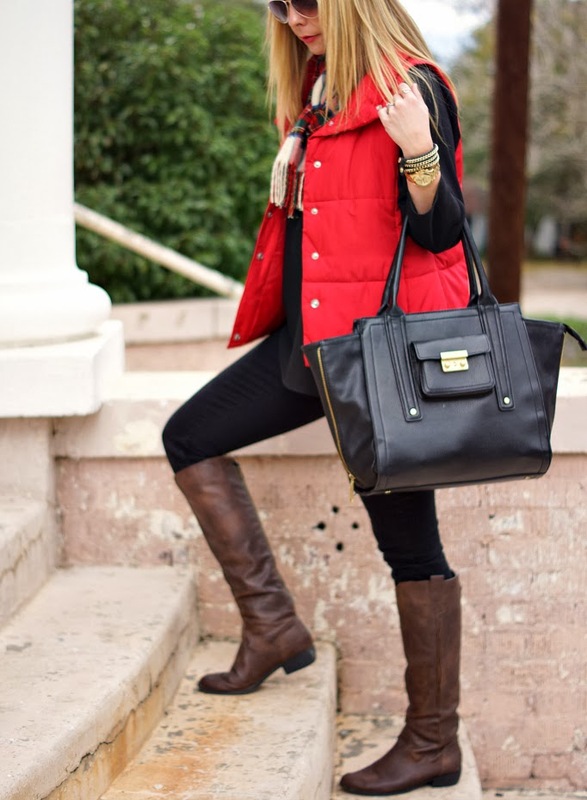 Oh and the perfect bag for winter! Merry Christmas! I love that scarf! I'll be on the hunt for a similar one during the after christmas sales! We still live close to our hometown and I love it. 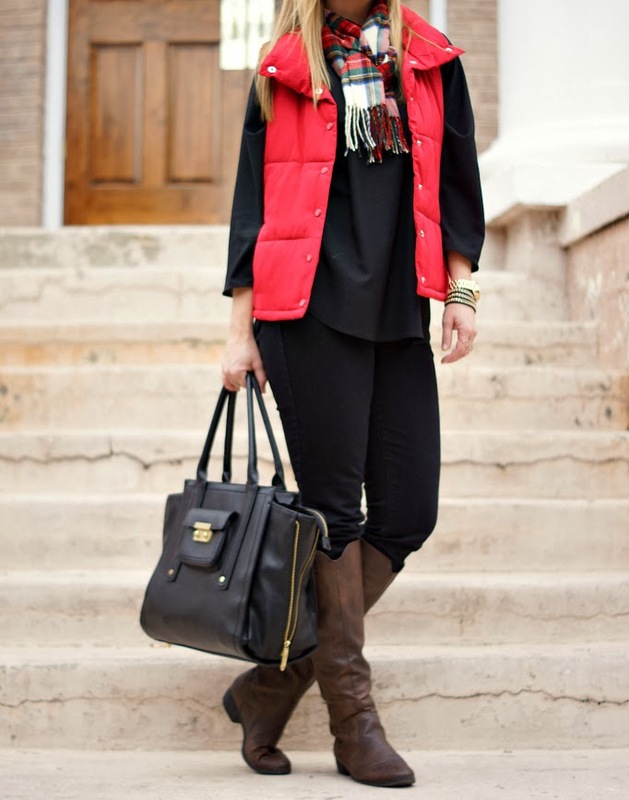 Love your laid back., but festive outfit. Hope you and your family had a wonderful Christmas!! Love love love that scarf!!!!! Love the whole outfit actually. So cute and festive! Your recaps always make me smile. I love that you and Ross danced in the kitchen together. 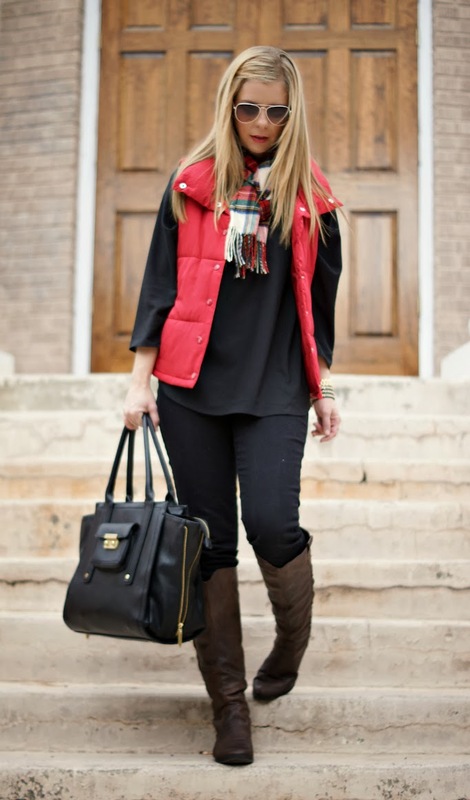 Great look, perfect for Christmas time!